CONGRATULATIONS! 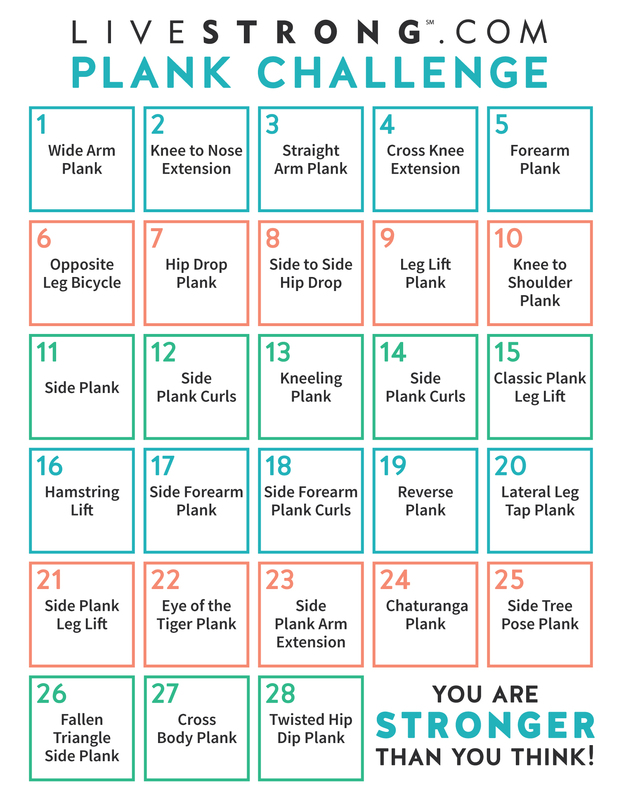 You made it to the last leg of our 4-Week Plank Challenge — but you're not done yet. This week we're hitting you with our toughest plank variations yet to push you toward a seriously strong core. Focus on your form this week — maintaining a stable core while moving in a controlled manner will help to tone your abs and prevent injuries as you move forward. HOW TO DO IT: Start in side plank balancing on your hand. Extend your top arm up and bend your bottom knee up toward your bottom arm. Next, lift your bottom knee up off the floor and balancing on your bottom triceps. Hold as long as you can before dropping down. Repeat this lift as many times as you can for 30 seconds before switching sides. HOW TO DO IT: Start in side plank. Lift your top leg several inches as you extend your arm out over your head and toward the wall (not up toward the ceiling). Now hold! HOW TO DO IT: Start in side plank. Rotate to come into a standard plank, but immediately lower into a Chaturanga push-up, with your elbows tucked into your side. Push back up, and then rotate to a side plank on the other side. Continue this for 30 seconds to one minute — however long you can do with good form. HOW TO DO IT: Start in side plank. Bend your top knee up toward the ceiling and place the foot on your ankle, calf or inner thigh (not on your knee). Extend your arm up toward the ceiling and hold. HOW TO DO IT: Again, begin in side plank. Extend your top arm up toward the ceiling and your bottom leg out in front of your torso. If you're feeling strong, you can lift the bottom foot off the floor for as long as you can with proper form. HOW TO DO IT: Start in a regular plank position at the top of a push-up. Then, raise your right leg and your left arm. Hold before switching sides. Continue alternating arms and legs for the full minute. HOW TO DO IT: Begin in a forearm plank. 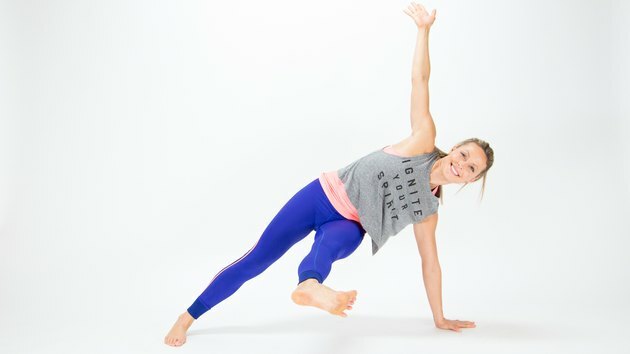 Twist your hips to one side and balance on the side of your foot, keeping your chest pulling toward your fingers. Hold this for 30 seconds before switching sides. Congrats on Finishing the Plank Challenge! This is the home stretch, so finish with everything you've got. And when you reach the end of the week, don't stop! Start all over again with longer holds or check our Facebook Challenge Group to find your next fitness journey and get support, motivation and workout buddies. Also, be sure to follow Elise on Facebook and Instagram. Love her outfits? Get her Week 4 look at Monreal London, lululemon and Spiritual Gangster.